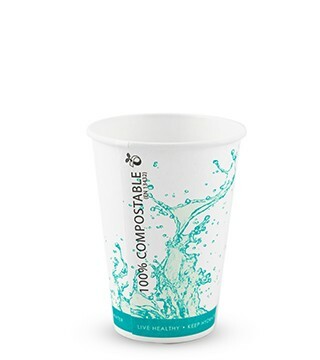 These disposable cups that look and feel like paper cups have a single wall only and can be used for cold drinks especially when using a water cooler. 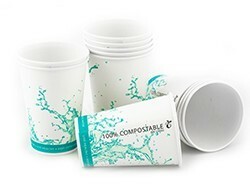 Manufactured using 75% sugar cane waste with 25% wood pulp and lined with PLA they conform to the EN13432 standard making them 100% compostable in a commercial composting facility. To dispose of these cups please make sure that they are put in your “green bin” or your “food waste bin” and not the recycling bin. Our Cup Holder is also available for this range of cups. To add a product directly into the cart, click on the Quick Buy button below the price per case.